In a well-planned operation, which contrasted sharply with those mounted earlier in the Gallipoli campaign, Allied forces successfully withdrew from Anzac and Suvla between 15 and 20 December. Following the failure of the August offensive, the British government began questioning the value of remaining at Gallipoli, especially given the need for troops on the Western Front and at Salonika in northern Greece, where Allied forces were supporting Serbia against the Central Powers. In October, the British replaced Hamilton as commander-in-chief of the Mediterranean Expeditionary Force (MEF). His successor, Lieutenant-General Sir Charles Munro, quickly proposed evacuation. 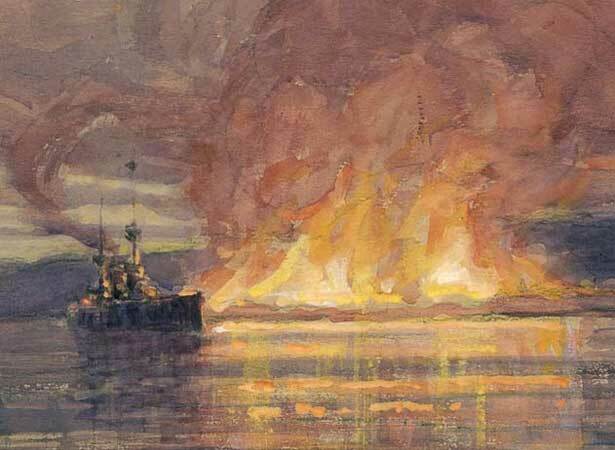 On 22 November, the British decided to cut their losses and evacuate Suvla and Anzac. Planning moved quickly and efficiently. The evacuation of Anzac began on 15 December, with 36,000 troops withdrawn over the following five nights. The last party left in the early hours of 20 December, the night of the last evacuation from Suvla. British and French forces remained at Helles until 8-9 January 1916. We have 21 biographies, 40 articles, related to The evacuation of Gallipoli begins.